A couple of months ago I launched a brand new e-commerce store that sells hand-poured, eco-friendly soy candles. I’ve been pretty actively promoting it via social media and blogger relations, but I knew that I wanted email marketing to be a part of my mix. The problem (maybe one that you have, too) is I had 0 people on my list unless you count myself. I didn’t want to spend a lot of money building up an email list (and quite frankly, I don’t have a lot of money to spend even if I did want to), so I had to get creative. Below you’ll find out WHY building up an email list is important and also the three simple steps I took to build up my list to a few hundred in a very short span of time. I hope that you’ll use these tips to increase your own email list quickly too! According to the Direct Marketing Association email marketing has an average ROI of $40 for every $1 spent. Also, a study by ExactTarget shows that 27 percent of consumers were likely to say that their favorite companies should invest in more email! Sounds like this email marketing thing can be a great way to increase sales. So, what do you do if you don’t already have an email list because a.) you’re a new company or b.) you haven’t been capturing email addresses for your leads and customers? The answer: start building your permission-based email list right now! What is a permission-based email list? It is one where the people on the list asked to be placed on it. When someone signs up for your email list they are opting-in thus giving you permission to email them. Basically, as a best case scenario you will be wasting your time and money since no one will want to look at your emails. As a worst case scenario you will get blocked from being able to send emails because you become known as a spammer. So, the first thing you need to do is ask people to politely opt in to your email list. The best way to get people to do this is by providing an incentive. You could offer an immediate discount such as “Sign up for our email list and receive a 20% off coupon” or you could offer another type of incentive such as the chance to win a prize. Running a contest/giveaway is the type of incentive I used to grow my email list from 0 to a few hundred over the span of just a couple weeks (and a couple hundred over night!). To grow my completely non-existent email list I decided to host a giveaway for my online candle store. I decided to giveaway $100 worth of candles to one lucky winner who opted-in to my email list by the end of November (at the time of this writing, the giveaway is still going on!). First, I assumed (correctly) that by hosting the giveaway on Facebook many of the entrants would Like my Facebook page thus providing me an additional method for marketing to them in the future. When I started the giveaway I had just over 200 people who Liked my page. As of this writing I have almost 500 Likes – the majority of which I can attribute to the giveaway since the Likes has increased in tandem with the growth of my email list. The second reason I hosted the giveaway on Facebook is because people feel comfortable using Facebook. Since I was trying to grow my list with people who could be potential new customers I had to reach an audience who had never heard of my company before (not difficult since my company is very new). People are cautious about providing information to sites they don’t know – but Facebook is a site many people trust. 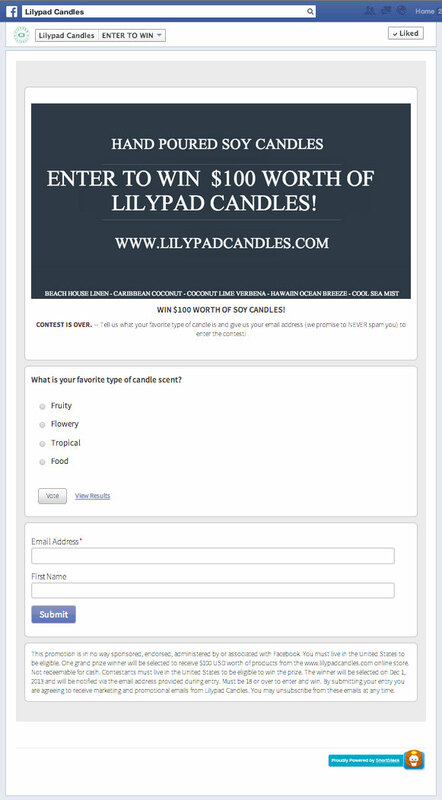 Finally, the third reason I used Facebook is because I knew using ShortStack would make setting up the giveaway entry form really easy. Instead of having to build a page on my website, I just needed to use the easy WYSIWYG editor in ShortStack. It took me less than 30 minutes to design and launch the app on my Facebook page. A view of the app editor in ShortStack. I made the entry process for the giveaway as simple as possible. Each user only has to do two things. 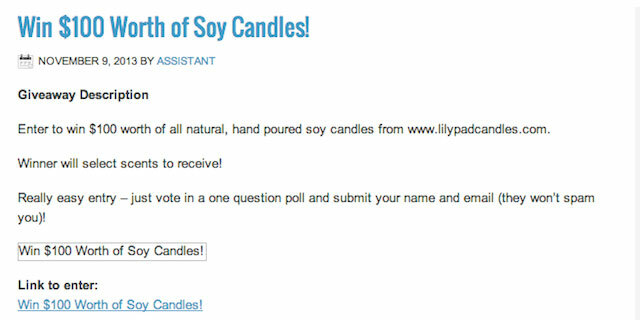 First they have to vote in a one question poll on their favorite candle scent and second they have to opt into the email list. I included the poll step in the giveaway because it’s a really simple step that didn’t create much barrier to entry but provides me with immensely valuable customer information. Now I know which scents I should look into making for my next candle collection which will come out in the Spring of 2014. The email and name submission form is actually integrated with MailChimp (using a widget inside of ShortStack) so names and email addresses are automatically imported to my MailChimp list. After I created the giveaway app in ShortStack I needed a free way to let people know about it. I could have run some low-cost Facebook ads but I didn’t really want to spend any money, so instead I Google’d sites that list giveaways and deals. I found a great list HERE and picked a handful of sites to submit my giveaway link to. Most of the sites will require you to enter a headline, body copy, start/end dates and a link to the giveaway as well as the rules for the giveaway. If you write these things out in advance you can simply copy and paste into the giveaway listing forms. I included the rules at the bottom of the giveaway app so these two links were the same for me. I think this is the simplest way to go. For your headline you want to write something clear and catchy. I made the headline very focused on the prize and its value to draw interest. The giveaway description was kept short and simple. I also made sure to include a line about how easy the entry is so that people would be extra enticed to click. After all there are hundreds (thousands?) of listings on each of the giveaway sites so you need to make sure your listing headline/description stands out. After all if no one clicks your link on the listing site you won’t be able to grow your email list. After I submitted my link to a few listing sites I went to bed (I did this around 12:30am). When I woke up the next morning I had almost 200 new people on my email list! At this time I decided I needed to do something to take immediate advantage of the list growth. What I did was set up an auto-responder email. An auto-responder email is when an email is triggered to send based on some action. I use MailChimp as my email software so I set up an auto-responder email to go out to each new member of my email list within one hour of them being added to it. Inside the email I thanked the person for taking the time to enter the giveaway and then I offered them an immediate discount to use in my online store. At the time of this writing my giveaway is still running and my email list and Facebook Like count continues to grow. Not as fast as it did when I first listed the giveaway, but the sites are still steadily sending traffic to my Facebook Page. They are also sending traffic to my actual website. In fact, if you think that a list made up of people interested in giveaways will never make a purchase from you … don’t. Exhibit A: A sale with Online Sweepstakes as the referrer. Thank you Online Sweepstakes for directly sending me a new customer! In all honesty though, I don’t expect this email list made up of giveaway people to convert at as high a percentage of other types of email lists. However, I do know that it is still valuable and I can still get sales out of it. And you can get value out of this type of list too. It’s all about understanding the persona of the list. You know the people on your giveaway list are people who love a discount so play into that. Every time you email the list be sure to offer a great discount. Also, don’t be afraid to get creative. You know this list of people are the type of people who are willing to go the extra step to get a discount or a free product. Use that knowledge to your advantage. Set them up with a referral code and tell them if they can get 3 people to make a purchase from you then they get a free product and/or really big discount. That kind of situation is a win-win for both of you. Now that I’ve shared with you the easy steps to growing your e-commerce email list it’s time for you to get started. Sign up for a free ShortStack account and create your giveaway app! If you have any questions feel free to leave a comment below or tweet to me @allenkristina and I will be sure to answer your questions! Kristina Allen is head of social marketing at a Miami advertising agency and a proud new e-commerce store owner! Kristina shares marketing and startup tips and insight at http://www.allenkristina.com.